Embark on an adventure in the African plains with Hot Safari Slot at Wicked Jackpots. Get the chance to meet magnificent animals on this slot consisting of 5-6 reels and 25 paylines. It is a creation of Pragmatic Play. 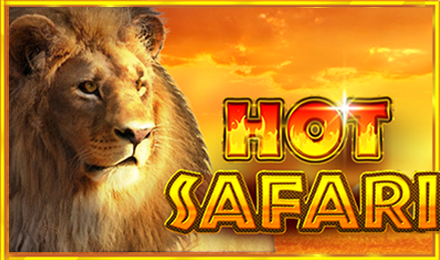 Hot Safari Slot is the perfect game for all animal and nature lovers. A 6th reel is added to the 5 reels for more fun and excitement on Hot Safari Slot. The game is set on a background showing a scorching sun shining on the African plains and the reels are framed in gold. On the reels, find symbols like Baboon, Lion, Elephant, Rhino, Zebra, Gazelle, Meerkat, A, K, Q, J and 10. Start your gameplay on Hot Safari Slot by using the + and – buttons to adjust your coin values. Next, click on the Spin button to initiate the reels. With the Auto Play option, enjoy 10, 20, 30, 50, 70 and 100 games played in rapid succession. Bet Levels: Bet levels available range from 1 to 10. Amount of Paylines Selection: The 25 paylines are fixed. Coin Values: Coin values range from 0.01 to 0.50. The wild symbol on Hot Safari Slot is the Lion. When it is in the centre position on any reel, it expands and fills the rest of the positions on it. During the main game, Free Spins and Super Wild Bonus Feature, Expanding Wilds remain active. When the Super Wild symbol lands on the 6th reel, it triggers the Super Wild Bonus. A Wild symbol is added at random on each of the 5 reels. When it is in the centre position, it expands and fills the reel. If 5 Wild symbols are in the centre position, a 10x multiplier is applied to your win. Earn one Respin while 1 wild is also added to each reel. The Baboon represents the Scatter symbol on Hot Safari Slot. Three or more Scatters activate the Free Spins Feature with 10 free spins. Multipliers are also available during this feature. Super Wild Bonus can also be triggered and you can win up to 20 free spins.